NAMM 2019: Martin has really pulled out all the stops this year; this marks the acoustic giant’s fourth announcement thus far, and this time it’s the turn of some typically impressive Special and Limited Edition acoustic guitars. Highlights include tributes to American-style tattoo pioneer Norman ‘Sailor Jerry’ Collins, the mango-topped CEO-9, and the electric-vibed OMCE Shadow and Blaze Burst. It’s not all high-ticket stuff, either; Martin has also honoured the 20th anniversary of its X Series models, and the 30th anniversary of its Navojoa, Sonora, Mexico manufacturing plant with limited-edition models. Scroll on down for the full lowdown, and visit Martin Guitar for more info. 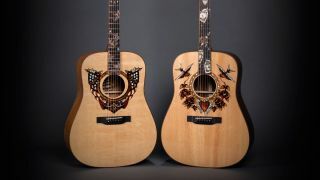 These Special and Limited Editions join Martin’s other NAMM announcements: the all-new Modern Deluxe Series, two far-out Woodstock 50th Anniversary acoustic guitars, as well as updates to the Dreadnought Junior and Road Series, and all-new Slope Shoulder guitars. PRESS RELEASE: In 1999, Martin broke into the world of alternative materials and created a whole new class of high-quality guitars: the X Series. In the 20 years since, the X Series has evolved to include multiple design changes and alternative materials. This Grand Performance model, featuring a solid hardwood neck, pearl pattern fingerboard and rosette inlay, and Morado fingerboard and bridge, harkens back to the earliest days of the X Series. Timeless tone for the modern age. PRESS RELEASE: The year 2019 represents a milestone in the history of our Navojoa, Sonora, Mexico, manufacturing plant – 30 years of operation. In that time, Martin colleagues in Mexico have produced world-class guitars and strings, and helped put affordable, high-quality instruments in the hands of countless musicians. Custom artwork from Robert F. Goetzl on the DXMAE honors these employees and features elements of Mexican national symbols on a custom HPL Dreadnought. The model also includes Macassar HPL back and sides, laminated birch neck, and a Richlite® fingerboard and bridge. PRESS RELEASE: Martin celebrates famed American-style tattoo pioneer Norman “Sailor Jerry” Collins in this special edition Dreadnought guitar. It features elements of Collins’s work, titled “Homeward Bound,” inlaid with seashell and hand-selected wood species on the headplate, fingerboard, and body. The artwork takes shape in a multitude of rich, earthy colors using a combination of pearl and natural wood tones. The wood tones are enhanced using a technique called sand shading. The level of artistic talent that went into creating this fine guitar is immediately evident and timeless. In addition to the custom artwork, this guitar features flamed koa back and sides with quilted bubinga binding and a custom inlaid koa headplate. The top is heavy bearclaw Sitka spruce and features non-scalloped, forward-shifted bracing found in Martin’s recently reimagined Standard Series. PRESS RELEASE: Martin celebrates famed American-style tattoo pioneer Norman “Sailor Jerry” Collins in this special edition Dreadnought guitar. It features elements of Collins’s work, titled “True Love,” inlaid with seashell and hand-selected wood species on the headplate, fingerboard, and body. The level of artistic talent that went into creating this fine guitar is immediately evident and timeless. In addition to the custom artwork, this guitar features figured East Indian rosewood back and sides with flamed koa binding and a custom inlaid East Indian rosewood headplate. 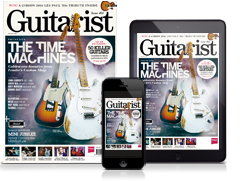 PRESS RELEASE: This special edition Auditorium-style guitar features an Adirondack spruce top with a multi-striped, abalone pearl rosette and quilted sapele back and sides with European flamed maple binding around the body and fingerboard. It is adorned with ultra-modern appointments, including a carbon fiber pickguard, carbon fibre and titanium open-gear tuners, and red dot Liquidmetal® bridge pins. PRESS RELEASE: This exquisite 00 14-fret slope-shoulder acoustic guitar exhibits a curly mango top with a gorgeous gloss mango sunset burst finish, paired with highly figured curly mango back and sides. Other features include antique white binding and heelcap with multi-stripe border, a compensated bone saddle, Liquidmetal® bridge pins on an ebony bridge, and an ebony fingerboard with Style 42 snowflake inlay. The look is completed with vintage open-gear tuners and a stylized script logo on a faux tortoise headstock plate. The model also comes with a modified V neck for fast finger work. Each model includes a label signed by Chris Martin IV and numbered in sequence. PRESS RELEASE: This limited edition custom 42-style Dreadnought features a Carpathian spruce top with aging toner, East Indian rosewood back and sides, and European flamed maple binding with multi-stripe border around the body, fingerboard, and headplate. It includes forward-shifted X-bracing, a high-performance neck taper for easy playability, nickel open-gear tuners, and an abalone rosette with multi-stripe border and abalone fingerboard inlay. This model is limited to 50 instruments. PRESS RELEASE: The OMCE Shadow was inspired by Martin co-workers who were enamored of some dramatic finishes found in the solid body electric guitar world. This Orchestra-style beauty is the successful result of experimentation with various finishing techniques. It features a Sitka spruce top and quilted maple back and sides with silver binding and a unique translucent black sunburst finish. The top is accented with a multi-stripe abalone rosette with a multi-stripe border, and it features Martin’s high-performance taper neck for easy playability. PRESS RELEASE: The OMCE Blaze was inspired by Martin coworkers who were enamored of some dramatic finishes found in the solid body electric guitar world. This Orchestra-style beauty is the successful result of experimentation with various finishing techniques. It features a Sitka spruce top with a translucent blaze sunburst finish and quilted maple back and sides with a mahogany burst finish. The top is accented with an abalone rosette with a multi-stripe border, and it features Martin’s high-performance taper neck for easy playability. The headplate is adorned with an abalone stylized script logo to complement the rosette. This model is limited to 50 instruments.